The prices above are per apartment per week, from Saturday to Saturday, and do not include the city tax. Check-in starts at 3:00pm and Check-out is by 10:00am. Bookings must be confirmed with the payment of a deposit that equals to 30% of the cost of the entire stay (minimum deposit € 150.00) and the balance must be paid upon arrival. There is an obligatory security deposit of € 200.00 which will be returned at the end of the stay, after the apartment and equipment have been checked. The apartments may not be occupied by more people (including children) than the number of beds indicated in all of the booking correspondence. Small pets are welcome (1 per apartment) subject to notification at the moment of booking and approval of the Administration, at the price of € 40.00 per week. It is understood that the Administration reserves the right to retain all or part of the security deposit paid by the Client upon arrival as reimbursement for any damages caused by the hosted animal. From 27.07.2019 until 24.08.2019 the minimum booking period is 2 weeks (unless otherwise indicated). The use of the fully furnished apartment with large kitchen complete with induction, 4 burner cook top, microwave oven, dishwasher, refrigerator with freezer, complete with cookware, dinnerware and kitchen utensils. Infant kit (crib complete with linens, highchair and bathtub) for children up to 2 years old, to be requested when booking (as long as supplies last). Studio apartment € 40.00, Two-room apartment € 60.00, Three-room apartment € 75.00. +10%/week (minimum € 20.00/day), to be requested when booking (as long as supplies last). 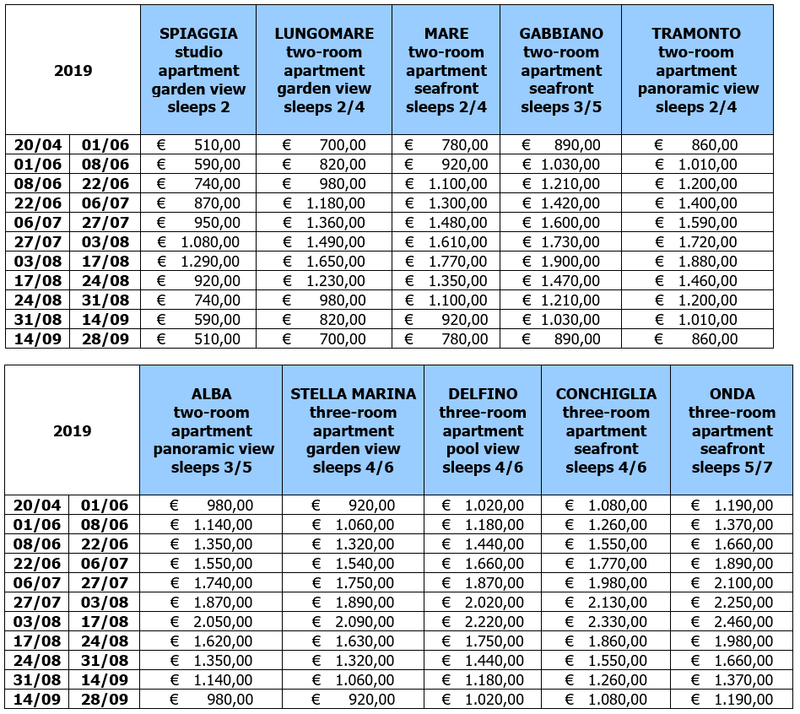 For apartments MARE and LUNGOMARE, which have a large furnished solarium terrace, there is a surcharge of € 110.00 per week. Breakfast, half or full board in the Restaurant Lungomare. - 5% discount for stays of at least 3 weeks (from 27.07.2019 until 24.08.2019 excluded). a city tax of € 0.70/person/day for a maximum of seven nights. Children up to 12 years of age are exempt from this tax.